A Palestinian TV station has killed off a controversial Mickey Mouse lookalike that critics said was spreading anti-US and anti-Israeli messages to children. The Hamas-affiliated al-Aqsa channel aired the last episode on Friday, showing the character, Farfur, being beaten to death by an "Israeli agent". "Farfur was martyred defending his land," said the show's presenter Saraa. Israeli critics had said the show was outrageous and some Palestinian ministers tried to get it shelved. 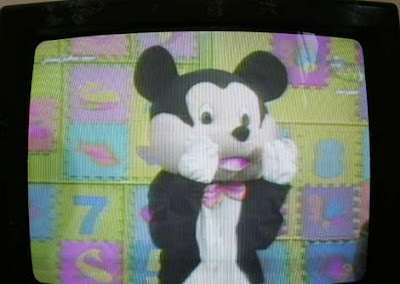 In the final broadcast an actor said to be an Israeli agent tries to buy the land of the squeaky-voiced Mickey Mouse lookalike. Farfur brands the Israeli a "terrorist" and is beaten to death. He was killed "by the killers of children", Saraa says. Al-Aqsa television told the Associated Press news agency the show, Tomorrow's Pioneers, was making way for new programmes. The channel had ignored demands from Information Minister Mustafa Barghouti for the show to be stopped. Mr Barghouti said it "was wrong to use a programme directed at children to convey political messages". In an earlier show, Farfur had said: "You and I are laying the foundation for a world led by Islamists. "We will return the Islamic community to its former greatness, and liberate Jerusalem, God willing, liberate Iraq, God willing, and liberate all the countries of the Muslims invaded by the murderers." The Israeli organisation, Palestinian Media Watch, said Farfur took "every opportunity to indoctrinate young viewers with teachings of Islamic supremacy".